Excessive jaw clenching and teeth grinding (bruxism) can accelerate tooth and jaw deterioration. To help our patients most comfortably avoid this, we customise night guards to their bite. The night guard acts as a cushion between the top and bottom dental arches. Prevents teeth damage – When someone suffers from bruxism, they unconsciously grind and clench their teeth causing chipped teeth, damaged fillings, and excessive wear on their enamel. The damage that occurs in your mouth can result in costly restoration procedures and even retreatment for your fillings. Wearing a night guard prevents your upper and bottom teeth from coming in contact reducing the chance of grinding and clenching. Reduces headaches and pain – The grinding and clenching of your teeth often cause jaw pain, tooth sensitivity, headaches, and a majority of other pain related issues. Investing in a night guard helps to alleviate the pain and headaches associated with bruxism and other disorders. Having your guard personalised to your mouth helps align your teeth and bite, relieving jaw pain. Improves sleep patterns – Wearing a custom night guard helps to relieve the pain associated with bruxism while providing maximum comfort for your mouth. The night guard positions your jaw in a way that promotes muscle relaxation. Once the stress on your jaw is relieved, you now can finally get some sleep. Sleeping with a night guard has been found to improve sleep patterns drastically in bruxism sufferers. A night guard, or bit guard, is recommended if you suffer from TMD (Temporomandibular Disorder/Disfunction) or you are a person who clenches or grinds your teeth out of habit or to cope with stress. Your dentist will help you determine is there are any underlying issues from that may be contributing to your clenching or grinding. Bruxism is the term used to describe unusual clenching or grinding of teeth. Bruxism can be caused by stress or jaws that are out of alignment (TMD). People with bruxism will prematurely wear down their teeth as well as suffer from sore muscles, headaches, neck aches and even dizziness and ringing in ears (tinnitis). Many people are unaware that they do have bruxism and claim they do not grind or clench their teeth. However, there are many tell tale signs of bruxism besides the headaches and sore jaws. If the edges of your front teeth have little chips out of them or are flat, then you most likely are a grinder. You dentist will help you determine if you have any signs of bruxism. 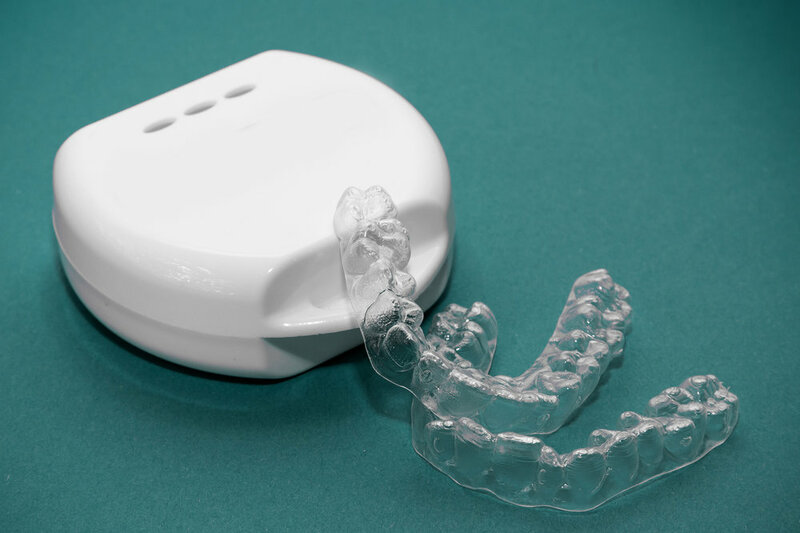 A night guard helps people with bruxism in a few ways. Not only does the night guard protect the teeth from wearing down any further due to grinding or clenching, it also adds more “tooth length” to open the jaws slightly to take pressure off the TMJ (Temporomandibular Joint). The night guard is also used to reposition the lower jaw to aid in damaged TMJ healing. For some people, wearing a night guard makes them aware of the clenching and grinding and helps them to stop grinding or clenching. How do I clean my night guard? The best way to clean your hight guard is to rinse the guard off with water and brush with your normal toothbrush after use. It is best to store the night guard in a bit of clean water when not in use or to be placed in the protective case provided. However, you may notice some white chalky deposits on your night guard after a few weeks of daily use. This white chalky substance is actually salt from your saliva that has adhered to the guard. The best way to remove these deposits is to soak your guard in some distilled vinegar for 20 minutes the brush with a tooth brush. How often should I wear my night guard? A night guard should be worn every night unless otherwise directed by your dentist. If your night guard is being used to correct TMD (Temporomandibular Disfuntion/Disorder) problems, then you may be required to wear the guard at all times. If you stop wearing your night guard for even a week, you will notice that the guard is tight and you feel pressure on your teeth. This is due to the fact that teeth are always moving slightly. If your stop wearing your night guard to too long, it might not fit. My night guard no longer fits – What to do? If you can no longer wear your night guard do to an extended period of not wearing it or a change has occurred to your mouth, the guard may be adjusted to fit again by your dentist. Only slight adjustments can be made to an ill fitting night guard. If you have had some extensive dental work done or lost a tooth, you will most likely require a new night guard. Sports guards are an important piece of athletic equipment for anyone participating in a sport that involves falls, body contact or flying equipment. These are individually designed and made in our office. Not surprisingly, they are likely to provide the most comfortable fit and best protection. Your dentist makes an impression of your teeth and then constructs the sports guard over a model of them. Because they fit and feel better, most athletes prefer customised sports guards. Sports guards typically cover the upper teeth, and are designed to protect against broken teeth, cut lips and other damage to your mouth. If you wear braces or other fixed dental appliances (such as a bridge) on your lower jaw, your dentist may suggest a mouth protector for these teeth as well. Why not get in touch with us today? When it comes to the very best for Whangarei Night and Sports Guards, we pride ourselves on reliable staff and trusted expertise. Why wear a sports mouth guard? A sports mouth guard should be worn when engaging in contact or ball sports to minimise injuries to teeth in the event of an impact. The guard will help cushion a blow as well as distribute impact forces over broader area to minimise damage to one or more teeth. the guard also protects damage from lower teeth being forced into upper teeth from an impact to the chin or the side of the face. What types of sports mouth guards are there? There are many types of sports mouth guards available. You can purchase ready-made or boil and bite sports guards from the internet or local pharmacist or sorting goods stores. There are sports guards for people with braces and young kids available. Your dentist can make a custom fitted sports guard for a reasonable fee. The number one factor in selecting a sports guard is the fit. If the guard does not fit securely around the teeth, then its effectiveness is greatly diminished. Sports guards that are too big or irritate the gums or lips will be uncomfortable to wear. Uncomfortable sports guard are always “played with” in the mouth and may not be in position when needed. The boil and bite sports guard are the most popular and provide a reasonable level of protection. You simply drop the guard in hot water for a period (as stated on the product instructions), place on the upper teeth and bite down while pushing the guard agains the gums with your fingers. As the guard cools, it retains the new shape. They are also ideal for kids wearing braces as they can be remoulded to accommodate tooth movement. However, they do not offer the same level of protection as a custom fitted sports guard. Why should I get a custom fitted sports mouth guard? A custom fitted sports guard made by your dentist provides the best level of protection. They provide the best fit around the teeth and stay securely in place. Custom fitted guards are the most comfortable to wear as every mouth is different and can last for years. A custom fitted sports guard is made by taking an impression of the upper teeth by the dentist. A plaster-like mixture is placed in the impression and allowed to set. Once hardened, the model of the upper teeth is removed from the impression and trimmed of any excess plaster. A sheet of 4mm thick rubberised plastic is heated to soften and vacuum formed around the model. Excess plastic is trimmed away and the edges are polished to remove any rough spots. A sports guard can usually be made in 2-3 days from your dentist. It is not recommended for people with braces to wear a custom fitted sports guard as the teeth are changing position from the braces. The best type of sports guard to wear when in braces is the boil and bite for braces product available at your sporting goods store. How long will a sports mouth guard last? A ready-made or boil and bite guard should last for a season of sport activity. These types of guards deteriorate quickly from use. You may need to replace your ready-made guard frequently depending on how they are used. Custom fitted sports guard can last for years if they are kept out of extreme temperatures and protected from light when not in use. How do I clean my sports mouth guard? Clean your sports guard with toothpaste and a tooth brush. If a tooth brush is not available after use, rinse with water and store in its until a tooth brush is available. Do not use hot water as all sports guards change shape with heat. Store your sports guard in a cool dry place when not in use.